Andy, with us in spirit. Jenn feels less guilty about boiling crabs after being pinched by one. The trip to Eureka was what I would deem uneventful. We left at midnight, sadly leaving Jerrid and Scott behind with a cracked muffler, discovered when they fired up to leave with us. We motored out of the bay, and between the stone walls of the jetty in the dark, where I realized why the rough bar crossing lights had been lit in the marina. It was mostly waves on the nose, and our bow rose high in the air several times but always settled fairly gently. We did suffer a casualty, a plastic serving tray that came with the boat fell off and shelf and became several smaller pieces of serving tray, but I suspect it won’t really be missed and can be easily replaced. Once across the bar, we headed southwest till we were clear of the next point of land, and began working our way south once again. 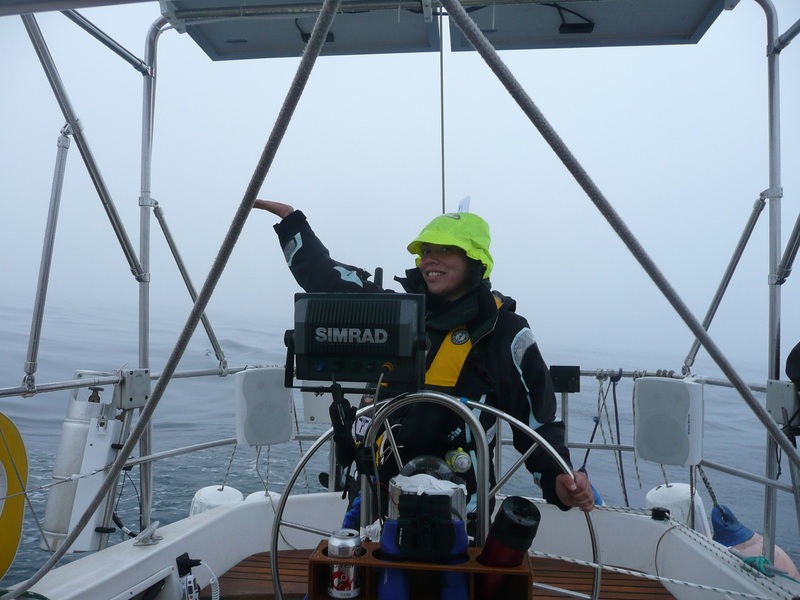 As forecast, there was little wind, gentle rolling swells, and not so much in the forecast, copious amounts of fog. I was able to thread two fishing vessels less than a mile apart, watching the radar, then the glow of their lights in the fog, and finally close enough to make out the boats slowly trolling for their catch. By dawn, we could barely see, maybe 100 feet around us. It didn’t seem that we were missing much few as we motored on, rolling off two hour shifts at somewhere around 5 miles an hour under the constantly droning diesel. The view consisted of water void of wind ripples rising up and down, patches of bull kelp, and birds that seemed impossibly small to be ten miles offshore bobbing on the swells. Then suddenly, the view also included a whale’s back breaking the surface 100 feet or so behind us. While amazing, it is also a bit scary, I’m not eager to have a whale, accidently or otherwise, bump the boat. We saw it one more time, then not again. 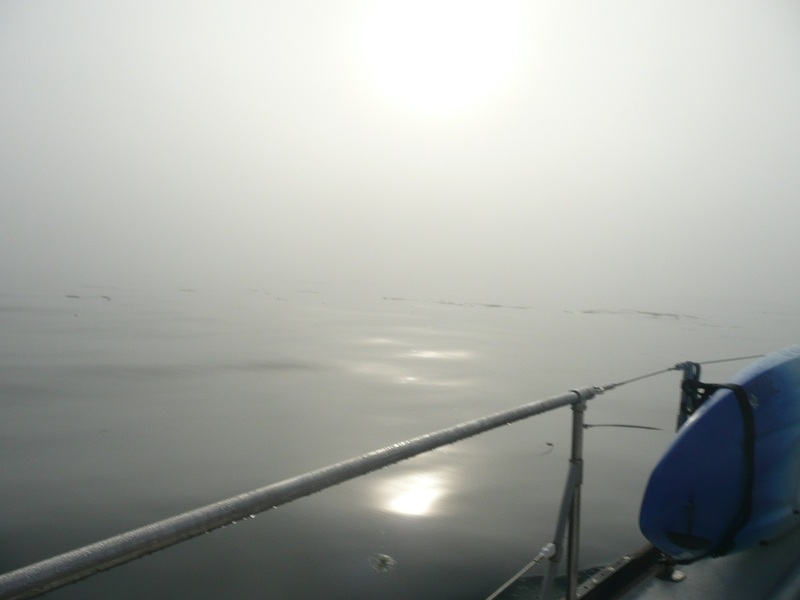 It was a sureal view, the fog shrinking our view of a vast ocean to a very small visible patch of water. We continued throughout the day, and into the next night, waiting for it clear. As the night hours ticked off, I contemplated that a round trip drive to San Diego from Seattle and back would probably take about the same time as this short hop, but as Jenn pointed out, where would we live? Finally dawn arrived, and although the sky had cleared briefly for a glimpse of stars and sliver of moon, the fog remained with us as we approached the entrance Humboldt Bay. Suddenly out of the fog a sailboat appeared, exiting as we lined up to enter the channel. 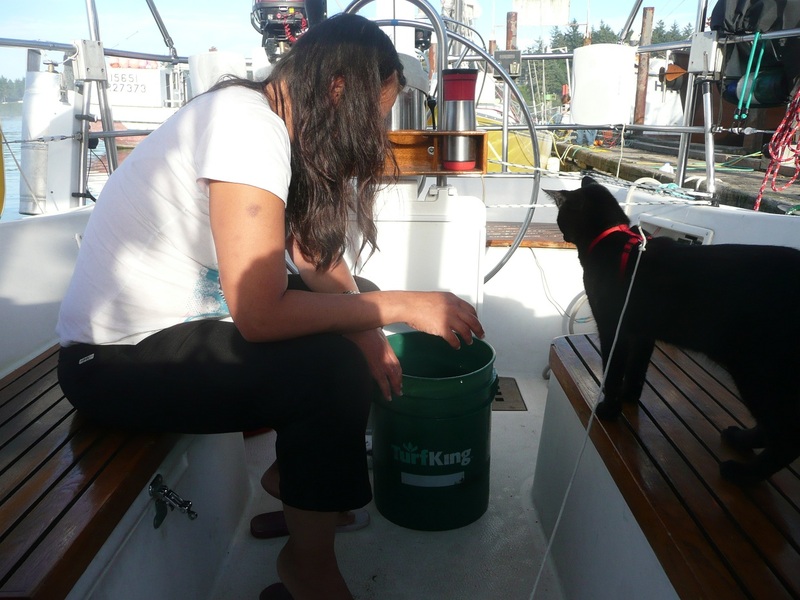 It really it a small ocean – it was Spica, a boat from Anacortes whose owner worked at West Marine. They left a few days before us and we’ve exchanged phone calls but hadn’t caught up with them until now. A brief VHF exchange to say hi ensued before I focused on entering a new harbor in fog so thick I could only see one jetty wall. Using radar, GPS and Jenn as a mark spotter, we crept through the channel then made a sharp left and headed to the marina on Woodley Island where we had a slip reserved. Pelicans winged their way in and out of the fog, graceful in a somewhat gangly way. Other new sea birds slid into view, making me wish our friend Melissa was along to identify and enjoy the change in species from now far away Puget Sound. Jenn celebrates crossing into Sunny California! Spotting our reserved slip, I spun the boat, calculated the wind and tide flows and managed a pretty decent landing. I’m still a bit challenged docking the boat, but it is getting better. It doesn’t seem such a big deal on the open ocean, but I am driving the boat into slips far more times than I anticpated. I think the next step is to start practicing some anchoring. A marina employee promptly met us on the dock to take our information, and after some naps we are headed up to the office to settle up, explore a bit and see if the Grocery Outlet in town has the same inexpensive wine and cheese as the ones back in Seattle. Then it is back to the weather forecasts to plot our next move. 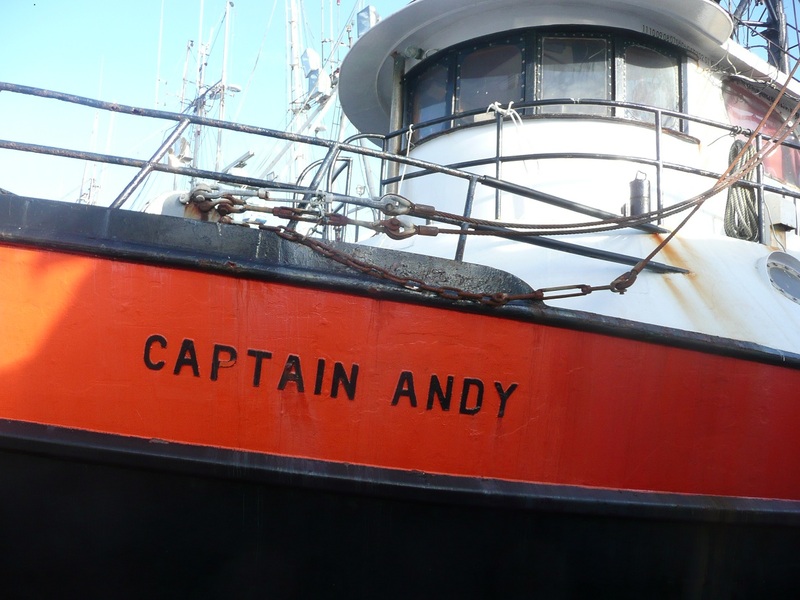 I’ve heard rumors of some northerly winds, so maybe we can finally hoist the sails and experience an ocean passage without the incesant sound of a diesel engine. This entry was posted in Uncategorized by Erlin. Bookmark the permalink.